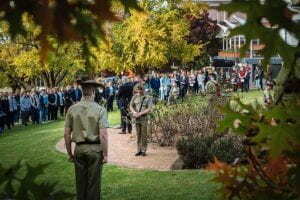 If you are on campus, UNE hosts an ANZAC service at the memorial garden located between Yarm Gwanga Child Care Centre & the Union Building, commencing at 8am that is open to all – you are warmly invited to attend and honour all who have been involved in active duty across all conflict. The Library will be open from 1:00pm to 5:00pm on Anzac Day. Rosemary for Remembrance: since ancient times this aromatic herb has been believed to have properties to improve the memory. Perhaps because of this, rosemary became an emblem of both fidelity and remembrance in literature and folklore. Traditionally, sprigs of rosemary are worn on Anzac Day and sometimes on Remembrance Day, and are usually handed out by Legacy and the RSL. Rosemary has particular significance for Australians, as it is found growing wild on the Gallipoli peninsula. If you are interested in investigating Australia’s wartime history, the Library offers some excellent resources, including print and ebooks, streaming video and journal articles, including but not limited to the list below. Try using Library ‘Search’ to discover even more! If you missed the presentation on the Future of Work, delivered by Jaime Casap from Google in Tamworth in September 2018, or even if you were there, it’s definitely worth watching the online recording. Jaime is Google’s Chief Education Evangelist and his message is about education: how it can disrupt poverty, and change our destiny. The future is already here: we are in the age of digitisation – technology, computer science, artificial intelligence, machine learning, augmented reality and virtual reality are all impacting the entire world, every industry, every day. The language for this revolution is computer science: fundamental skills around digitisation, fundamental elements about understanding how computers work, understanding how computational thinking works, understanding the role that technology plays for everything. The skills for the 21st century are problem solving and critical thinking. It’s not about jobs going away, it’s about jobs changing, and adapting to those jobs and how we have to prepare for this: taking knowledge and using it, doing something with it – what is most valuable is what you do with information. All work will be automated to some degree. 65% of the jobs in the future don’t exist today – Google didn’t exist 20 years ago! The UNE Future of Work Predictor app has recently been launched. Give it a try to see how exposed to disruption your careers is. It takes less than a minute to see overall how much your job will change; how tasks in your job will change; how your qualification compares; and wages and employment changes for your job. Fixing Google Scholar, a few changes! Some UNE staff and students may have been frustrated at times with Google Scholar turning them away by the Google Scholar CAPTCHA mechanism. In peak times of demand, Google Scholar has denied access to those wanting to access articles because of the CAPTCHA functionality. 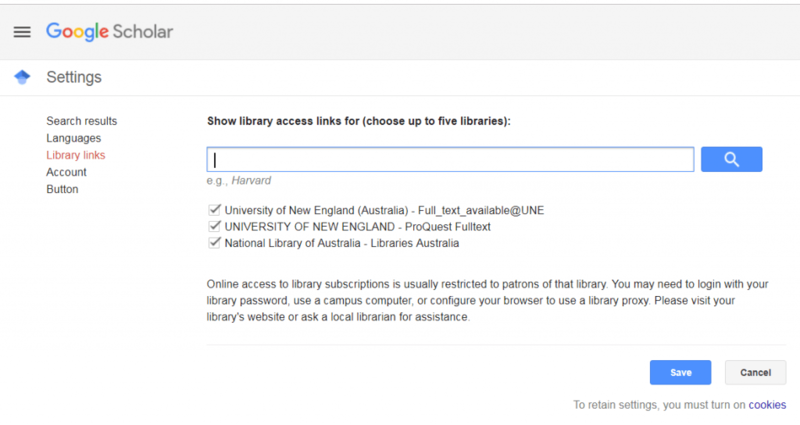 UNE Library has made some changes to the way Google Scholar operates. From now, you will no longer be able to access full text articles through the article title. Instead, you will need to use the Full_text_available@UNE link. Did you know you can check to see whether your Google Scholar links to UNE Library? All you need to do is click on “settings” within Google Scholar, locate the “Library Links” button, search for University of New England – Australia, and select the appropriate links. If you have any questions, don’t hesitate to contact the library and we will do our best to help you. Where do I find my Past Exams? Did you know the location of your Past Exam papers has changed? The Past Exam Collection via Moodle is where you need to go to access past exams for your unit. This collection includes exam papers from the previous 6 years for you to review and use for your studies. It is important to note that not all past exams for your unit will be available, it is up to your Unit Coordinator to release exams into this collection. You can access the Past Exam Collection in a number of ways, either directly from your Moodle unit, or from this link. The first time you open this Moodle site you will be required to “self-enrol”. Once you “self-enrol” you will be able to navigate the list by unit code to your specific unit. Do you need some help studying for your exams? Take a look at the Academic Skills Office (ASO) resources on preparing for exams. Plan ahead, manage your time effectively, and get your head in the game! EndNote X9: Now available at UNE! Did you know that EndNote X9 is now available at UNE for students and staff to download? To support this new EndNote version, the Library has created a new subject guide, EndNote X9. Library EndNote workshops have also been updated to train on the new version. For those of you not familiar, EndNote is bibliographic referencing software. It allows you to put together a library of references, and then insert these references into your Microsoft Word document (for example, a thesis or assignment). There are also other similar applications that can do this, for example, Zotero, and Mendeley. With EndNote X9, UNE has purchased a site license to make EndNote X9 freely available for all our UNE students and staff to download. An increased research focus with further Web of Science (WoS) integration; for example, Manuscript matcher (to get suggestions on which WoS-indexed journal to potentially publish in) has been improved! Improved capabilities for collaborating/sharing your EndNote Library with colleagues (for example, increased control/permissions when sharing)! See the EndNote X9 subject guide’s page ‘X9: what’s new!’ for more information! If you are already using a previous EndNote version like X8, upgrading to X9 means that you will get continued updates. If you are happy with your current version, or if the timing is not right (for example, if you’re about to finish your thesis! ), you don’t have to move to EndNote X9. The Library will continue to support our students and staff with X8 questions. Please note as well, that there is a bug in EndNote X9.0 (especially negative for Windows computers): so if you move to X9, make sure you update to EndNote X9.1 straight away! How do I get X9? This page has information on how you can first check your system’s compatibility requirements before downloading the software. There is also important upgrade instructions for those of you who already have an earlier version of EndNote installed (for example, compressing your Library and backing up modified files before you uninstall the old software or download the new software). Finally, make sure you have a look at how to check for updates to move to X9.1 (and avoid X9.0). Any questions or issues when installing X9 should be directed to IT Service Desk. Please note that all Mac users need to contact IT to have the license key installed. IT Service Desk can be contacted regarding EndNote installation via 1800 763 040 (free call), +61 2 6773 5000 or email (servicedesk@une.edu.au ). For general EndNote questions or to attend an EndNote workshop, please contact the Library! -Pauline Jenkins, Researcher Services Librarian.